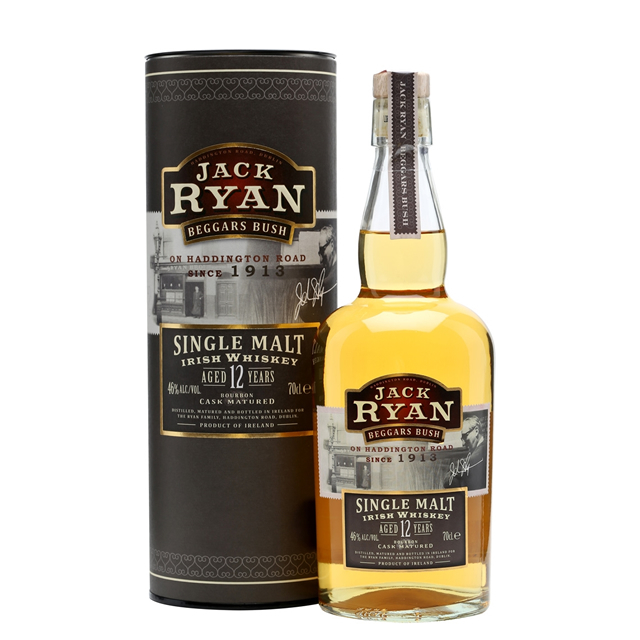 Jack Ryan Malt Whiskey	No ratings yet. Jack Ryan’s pub is a famous old Dublin established on Haddington Road, it is also known by many locals as Beggars Bush. The pub traded as a traditional grocers for many years with a pub and shop operating in unison. At the time they bottled their own brand of malt whiskey that was sourced from the old DWD on Jones Road. This new whiskey is a limited edition recreation of the brand, DWD is long gone so the whiskey comes to them via the Teeling Whiskey Company. Limited to a production of just 1450 bottles. Lots of malt, and tropical fruit flavour characters. This has been matured in ex-bourbon casks. Nose Intense tropical fruit aromas of passionfruit, pineapple, lemon and orange peel with a touch on cinnamon and ginger. Palate Smooth and oily textured. Even at the full 46% it is soft and easy to drink. Flavours of fresh pineapple, lemon, oranges, marmalade and ginger snap with some honey and oak. Finish Becomes more malty and biscuity with the oak flavours also shining through. Colour Bright gold in colour.